Keep your firearms in a cool place when fire hits. 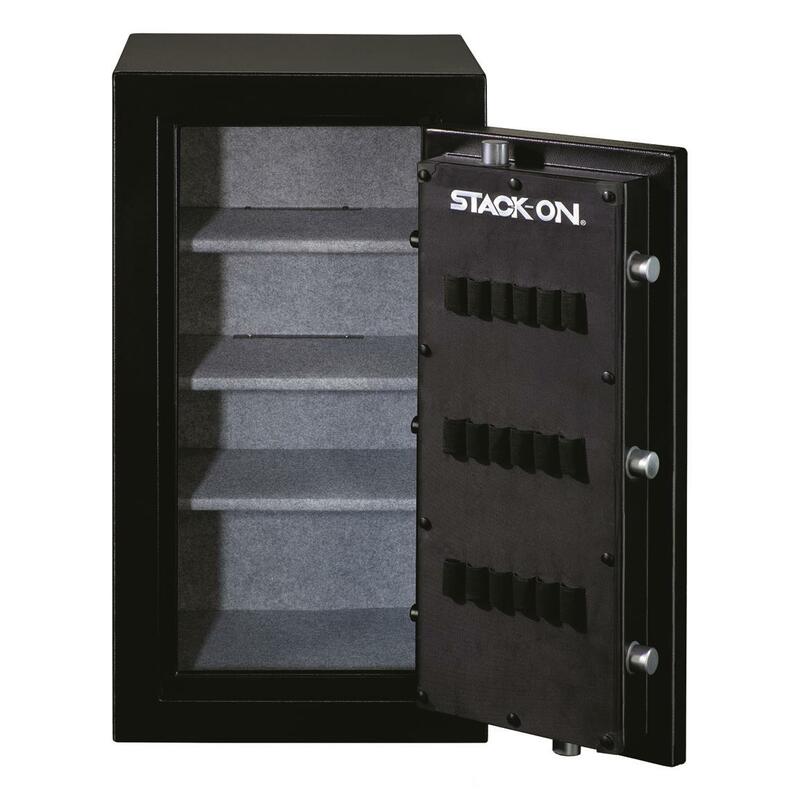 Fire resistant up to 1,400ºF, the Elite Shooter 40" Safe by Stack-On can take whatever is thrown at it and still keep your firearms safe and secure. The reinforced steel doors are filled with fire retardant material. The door stripping expands when exposed to heat, sealing the door and protecting the safe's contents from fire. The drill-resistant hardened steel plate, located behind the lock, protects your locking mechanism from those up to no good. 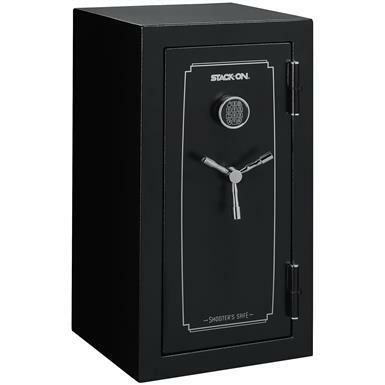 This safe is approved by the California Department of Justice as meeting their standards for firearm safety, and you know how strict California is. The exterior has a powder paint finish with chrome accents to make your safe as stylish as it is secure. The Elite Shooter 40" Safe features an electronic lock. The lock is programmable with a 3-8 digit code, keeping it personal and easier for you to remember. The batteries are accessed from the front for quick and easy change out when they die. It has 4-way locking with five 1.5" tapered live action locking bolts and three 1" dead bolts for a total of eight locking points. The large 3-spoke, all-steel handle rotates to extend and retract the live action locking bolts. Configure it as you need it. 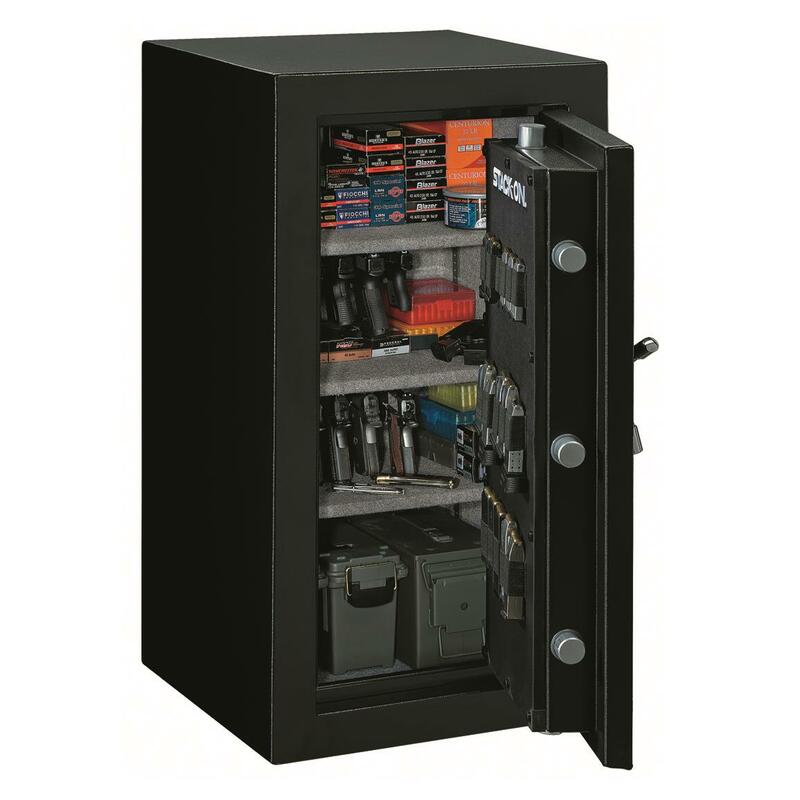 This Safe is fully carpeted and includes two handing pistol racks that attach to the back of the shelving. Each rack can hold up to four pistols. Plus, you get adjustable barrel rests that provide flexibility to store MSRs, ARs and long guns. An included "extra" barrel rest allows you to configure the safe for convenient gun access or maximum gun capacity. The patented barrel rests and standoffs keep scoped rifles away from walls and provides for one position storage. It's sized to accept rifles as well as side-by-side shotguns. 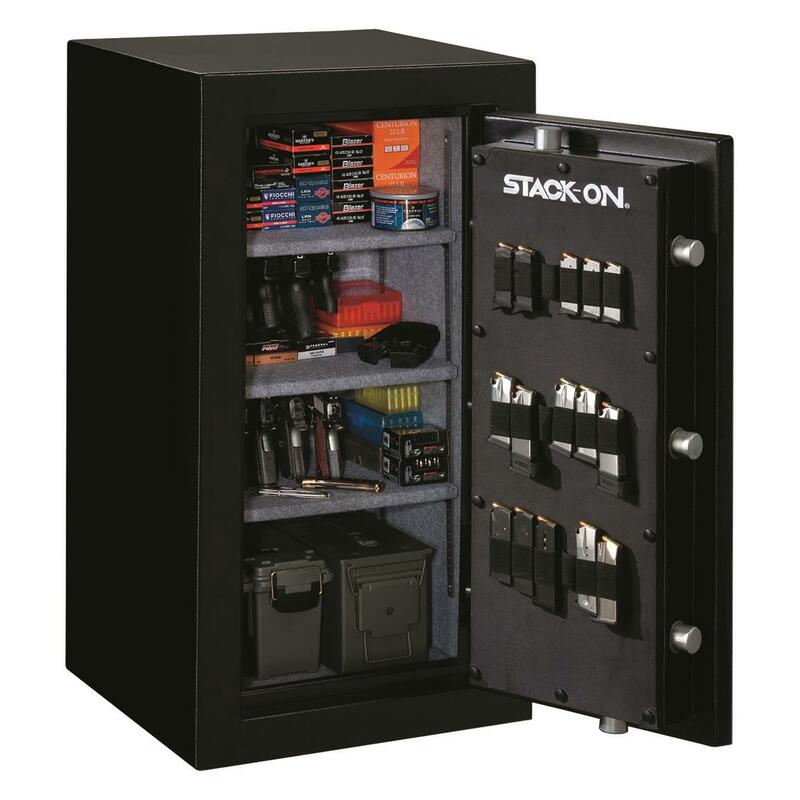 Three adjustable shelves are included to store valuable or firearm accessories. The door has sewn-in pockets and pistol holders, as well as MOLLE strips for accessory storage. Note: This item is shipped by commercial carrier curbside. Unloading is the customer's responsibility, including off the back of the truck. This product ships in one box, measuring 40"l. x 20.88"w. x 19.75"h. and weighing approx. 270 lbs. No expedited delivery. High-value orders require a physical street address, otherwise insurance costs will be added to the shipping total. Exterior Dimensions: 20.87" x 19.76" x 40"h.
Interior Dimensions: 18.5" x 13.54" x 37.64"h.